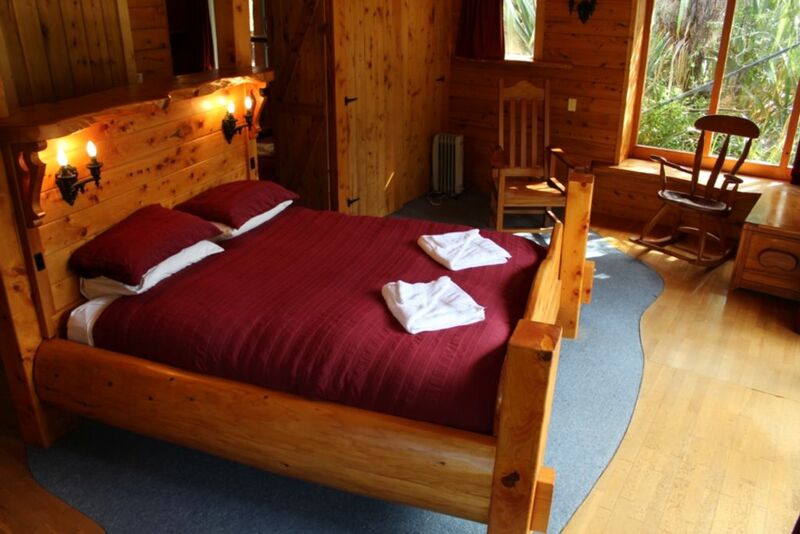 Situated at the Historic Dreadnought mill, nestled amongst mature grounds with a magnificent view of Mount Ruapehu is this stunning high-stud, 5 bedroom, 2 bathroom genuine log lodge, which sleeps up to 10 guests. Natural timber interior and exterior and luxurious hand crafted furniture thoughout. Relax in the super-warm open plan lounge with abundant seating, SKY TV, DVD player and surround sound system and stereo. Enjoy dining on the superb log slab dining table and the fully set up kitchen has fridge/freezer, stove, microwave and small appliances. Cosy enough for a romantic couples retreat or open it up for your group or families to enjoy. The master bedroom has a stunning timber frame King bed and at night you can lie in bed and watch the mountain groomers working on the slopes! The laundry has a washing machine and there is a snazzy drying rack above the fire place for your ski gear. Plenty of off-street parking right outside the lodge. The Lodge will be warm with the fire going and the beds made up ready for you to relax and enjoy. Great 18 hole golf course ,well kept all year round and a lot of the time you can have it to your self . It has Blue, White, Yellow,and Red tee for all levels of golfer. Taupo Is the nearest Lake and the largest in the north island, and is one and three quarters of an hour drive to get there. A great property. Friendly host - fire lit before we arrived and lights on. Superb location for the snow - 5 mins to bottom of the mountain road. Lots of space and a massive lounge with plenty of seating for 10 plus! Only slight downer was some of the view of the mountain was obscured by trees - get your chainsaw out Wayne! Definitely a great place to access the snow and very comfortable for large groups. Highly recommend. We had an amazing stay! They had they fire on prior to arrival, making it nice and cosy for us as soon as we stepped in the door. The Sawmill Log Cabin was well equipped, just bring your food and everything else is there for you. 100% would stay again and would recommend for anyone looking for a little Ohakune get away. This was a fabulous place for our extended family to spend some time together relaxing and exploring local attractions. Lots of room for the 8 of us. We especially appreciated the large lounge area with 5 comfortable couches and big woodburner. Heaps of extras in the kitchen. We cooked and ate in most nights. The Log lodge itself and the art work inside added to the positive experience.An easy drive/ short bike ride in to Ohakune. A brilliant spot for 9 of us to enjoy a weekend in and around Ohakune - all the bedrooms are a good size and the living area is lovely and spacious. Would definitely stay again, thanks Wayne! Summer is the base for canoeing the Wanganui River on 3 or 5 day trips, or trips to the bridge to nowhere ,and White water rafting in Turangi 1 1/2 hrs away. There So much to do around the Ruapehu I came here for 3 month 33 years ago and still love very day.